I did not see this coming. I had thought, only myself mattered to me. All my ambitions, my career, my studies, my Go, my self-development … they all don’t matter now. Isn’t it crazy to let go of things that I have fought for all this while, for something I barely know? It has been for a while since I wanted to be a more serious blogger. While telling about my life, opinion and feeling on this blog serves my emotional and psychological needs pretty well, I always had hoped to have a higher purpose of existence on the Internet. Techpiece is my attempt to realise that. It’s a platform for collaborative blogging for me and a friend, Soha who is doing PhD in the UK in power engineering. I’ll try to write articles more closely related to Malaysia, in particular about telecommunication, security and software. 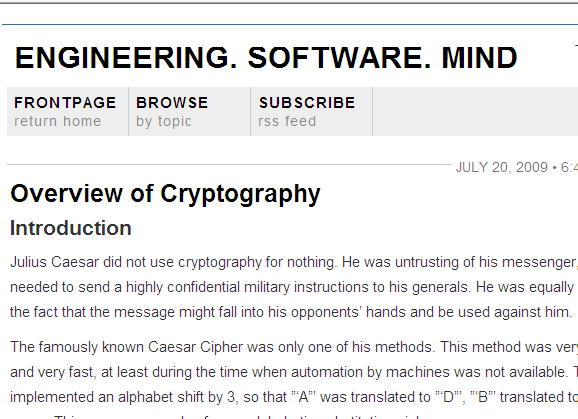 I’ve written about cryptography in general that is unrelated to Malaysia. Actually I only reused an old article from here, because Soha pushed me to post according to schedule. LOL. Next in my plan is to write about Streamyx and Home Surveillance in Malaysia. If you have any technological questions that you hope to be answered, just ask me anytime. I’ll answer or research the answers. Seems like a tough project, but hopefully I will persevere. Go, Food and Friends constitute a common formula for my Saturdays. Honestly I am content with living on such formula for foreseeable future to come. Yesterday however was especially wonderful because I kind of had an overdose of each of them, plus attending an orchestra performance. For Go, I had three games against Boon Ping and managed to win one as black. The third and final of our matches saw me losing as white with 1.5 moku. I am however very satisfied with the game as I managed to carry out tesuji and the sequence I had in mind, instead of the waiting-for-mistake stategy I normally use. The evening half was spent with watching an orchestra with Philip, Alex, Shino, Dennis and Dennis’s sister Lavinia. Actually I was not really interested in music but I thought I should spend my weekend doing something. Afterall, I was told that the ticket was free. Heck, turned out it was an RM38.00 friend’s ‘joke’. Luckily my wallet that time was at least RM100 fat. 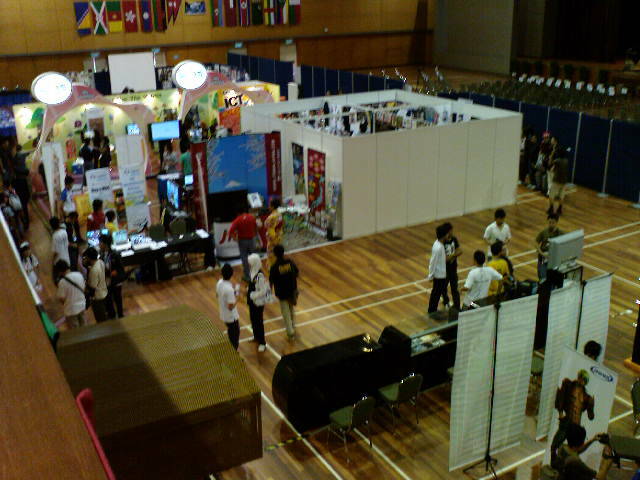 The orchestra was held in KLPac in Sentul. The crowd was large and lively, it seemed that the environment was less restrictive than Petronas’s philharmonic as Dennis observed. I however, did not know that so I wore my suit. The orchestra. The conductor was especially energetic with funny gestures. 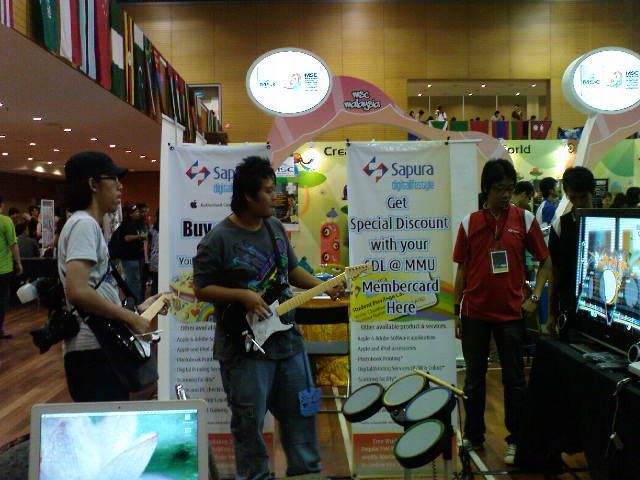 I really think that the excessive gestures were just for display, but then, I dont know much about music. We sat at the front, in the third row. Good view from there, could see the small pianist jumping in her seat as she ‘press’ed hard the piano key. What’s a better word for press there? Crowd was nearly full ! Almost me. Real me has no fat ! Our group. Alex, third from left is a violinist who got us all the tickets. After the show, we had supper in Wangsa Maju in a very famous mamak restaurant there which ironically I dont know the name. But Dennis who studied in TAR college before told us the history of this mamak restaurant, and how impressed he was with the staff exceptional ability to memorize orders. 2nd day of Daicon. No promoting Go, just enjoying the cosplay! During the times when I watched anime really a lot, I had two things in mind. Dreams, and fantasies. With dreams, I aligned myself to the story line, got myself to learn Go, kendo, and boxing. 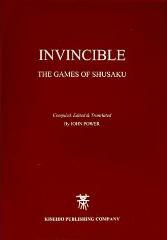 I dreamt of being as good in those as Hikaru, Kenshin Himura and Makunouchi Ippo. With fantasies, I dont think I need to say much. This girl was extremely popular among photographers. She’s awesome and I regret that my presence spoils the picture 😦 . Why couldn’t I look more of a hero? Why couldn’t I be more creative with the pose? A tease 10 cm too short? Amazing group which was also highly popular with the photographers. The blue one was especially gorgeous (personal opinion). Some photographer asked her to do this weird pose, and I was too lazy to wait for her to stand up. Another take of the blue girl. Anyway, Fallingstones had also posted about the event on his blog. Found a picture of myself playing against the MWA President, Mr Tiong there. Another picture of me, this time playing a teaching game with a beginner. 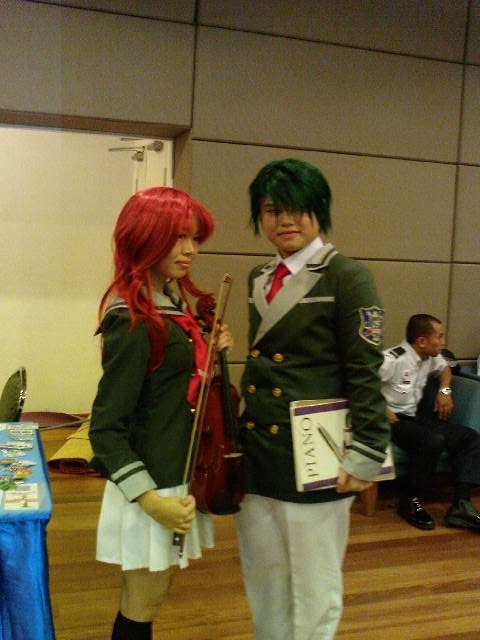 Picture from MWA forum, posted by Shino. Thanks. 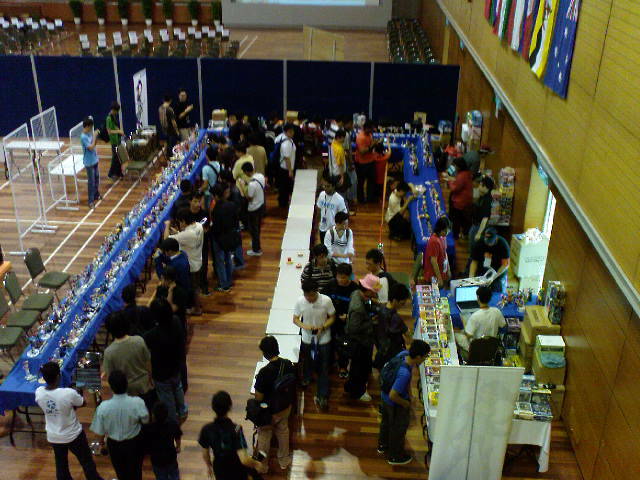 I attended the first day of Daicon at Multimedia University in Cyberjaya today. Daicon, for those who dont know, is a celebration of modern Japanese visual culture. Well, I actually dont know much about the purpose or message of Daicon, but I sure did enjoy the presence of cute university students in anime-like appearance or cosplay. Reminds me of the old time when I was so infatuated with everything Japanese. I do envy the current generation a bit, for being very brave at expressing themselves. I realise now that I did not really spend my youth in the most fun and satisfying way. Regrets creeping in. 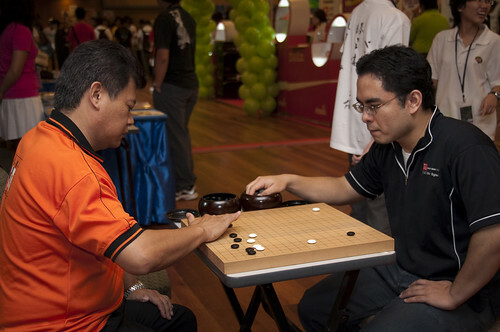 Anyway, I was actually there to promote Go, under the name of Malaysia Weiqi Association. We did get quite a lot of people interested in the game, and at one point, I nearly lost my voice. It was hard explaining the game to the beginners while fighting to be audible against the background singing. Ah, the singing … some were really bad although their courage probably should be commended. Some of the pictures below. Hopefully I could get more from Yi Zheng later. For people like me, who are not keen to go back to university, but need some guidance for self-study initiatives and effort, free online courseware is perfect. I haven’t tried the materials available yet, but MIT Free Online Course Materials seems to be a good place to go to. While MIT stands for Massachussets Institute of Technology, there are also materials relating to History, Linguistic and Philosophy, Music and Theatre Arts and Foreign Languages. I had a talk with a friend before, about being Jack of all trades, master of none. I guess, my blogging here is just an extension to the discussion, that I simply had to forgo during my talk with him. Our talk started after I question him on his motive to study math. No, not as in taking up math course in university. But, as an adult, who wanted to study math purely for self-interest among many other things i.e. politics, technology, religion, science, history etc. He claimed to be Jack of all trades, master of none, unlike me who chose to specialise in technology and software engineering. At the end of the talk, we both concluded that each person chooses whatever that suits him most. Note : It was a friendly chat. We were not arguing, were not even debating anything. Actually I had been a ‘generalist’ before (cant afford to write JOATMON all the time). During the earlier years of my secondary school era, I played a lot of sports, but did not make into any team because I didn’t want to commit to any training schedule. I had also probably attended the first session of most health/martial art practices including silat, taekwondo, kickboxing, boxing, kendo, yoga etc. I had also made trivial programming in numerous number of programming languages i.e. Pascal, Delphi, C, C++, Perl, PHP, Python, Ruby, C#, Java and assemblies. And let’s not forget human languages, I had also been in formal classes for Malay, English, Chinese and Arabic , and also had pathetic attempts at Japanese, Korean and French. Strategic board games? I play them all except backgammon. Okay, I risk being called show off. Actually it’s just a little retaliation. I felt that being called a specialist had invalidated my life and every kind of person I was before. However at the moment, I am not so much a generalist. It is too hard to derive tangible benefits from being one. Despite the above may sound impressive, I was a nobody in MCKK among my friends who were school representatives for football, rugby, basketball or hockey. I failed job interview at ARM Limited, Cambridge because I couldn’t exhibit mastery of ARM architecture and the assembly instructions. And I did not know how to swap values of two variables in C without a temporary storage ( I still don’t know how ). Keeping up with new technologies had costed me a lot of time and money, but until now I still have no confidence to take up freelance job. And all those extra languages I learned? .. it’s as if I had never !! Should I be a generalist or a specialist? The question is not really critical to be answered now, although in the limited career-wise context it may be. I however prefer to heed the quote at the top, to be more than one, many people, as many as I can think of.